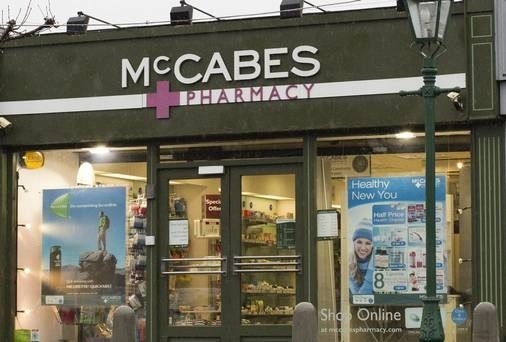 OPERATING profits at the company that operates the McCabe pharmacy group soared 40pc to €7.59m in the group’s last financial year. Accounts just filed by Behey Ltd to the Companies Office show that the group saw operating profits jump after revenues increased 7pc to €57.9m in the 12 months to the end of January 2013. The family-owned business, led by MD Sharen McCabe, operates 20 pharmacies across the country with the majority located in Dublin, while the group also runs the Radisson Blu Farnham Estate hotel in Co Cavan. The figures show that the group recorded a modest pre-tax loss of €74,520 after interest payments of €4.97m and non-cash depreciation and amortisation costs of €2.7m are taken into account. The loss last year compares to a pre-tax loss of €3.4m in fiscal 2012. Numbers employed last year increased by 24 to 454 and the group’s staff costs rose from €10.1m to €10.8m. According to the directors’ report on the performance of the pharmacy outlets, “turnover increased due to a good performance from the retail side of the business and increased volumes in the dispensary. Gross margins also improved due to careful purchasing and management of direct costs”. The directors state that the outlook for the pharmacy sector in 2013 and beyond will be extremely challenging. They point to imminent introduction of generic reference pricing legislation; depressed prescription volume due to rises in the GMS item levy; cuts in the number of medical cards in circulation; and continued private prescription pricing competition. Other key factors cited include the continued review and reduction of the fees that pharmacies receive from the HSE for dispensing medicines and the escalating costs of maintaining pharmacies to comply with regulations. On the performance of the Radisson Blu hotel, the directors state: “Farnham continued to perform well and its revenues increased in the year to January 2013. This is being driven by improvements in occupancy levels and the average room rate. Group bank loans and overdrafts were €72m. Accumulated losses were €47.4m and there was a shareholder deficit of €46.1m. Cash fell from €4.8m to €3.9m last year. Posted on January 16, 2014, in #ireland, #retail. Bookmark the permalink. Leave a comment.